The new and improved Caltex with Techron now contains Clean & Glide Technology™ specially formulated to clean and protect your engine. Caltex with Techron’s new Clean & Glide Technology™ is now available across all petrol grades. Caltex with Techron contains an active cleaning ingredient that removes dirt and prevents deposits from forming on critical parts of your car’s fuel system. A clean engine will function at its most optimum to give you maximised power, better fuel economy, lower emissions, a smoother drive, and reliable performance. Enjoy 5 benefits in 1 fuel when you use Caltex with Techron. Experience the same great cleaning performance that you’ve come to expect from Techron, and then expect a bit more. With a friction reducing additive designed to protect metal components and improve efficiency, our new and improved formula helps to deliver enhanced engine protection, maximised power and improved fuel economy, giving you a better journey, compared to our previous formula. The Clean & Glide Technology™ in the new Techron® is designed to coat and protect metal surfaces. This helps to reduce friction and wear, keeping your engine clean to deliver optimum performance. The ability of the new Techron to protect metal surfaces was proven in the High Frequency Reciprocating Rig (HFRR) lubricity test. The HFRR lubricity test is a standard test for diesel, designed to determine its ability to protect metal parts in the fuel pumps that rely on diesel as a lubricant. The HFRR lubricity test was modified to safely test the lubricating properties of petrol. The new Techron with Clean & Glide Technology™ contains components, which are designed to coat and protect metal surfaces, reducing wear by up to 38%1 and friction by up to 41%2 compared to our previous formulation. (1) Compared to previous formula. Figure based on average results of lab tests conducted by Caltex across Asia Pacific & Africa; results may vary from country to country. (2) Compared to previous formula. Figure based on average results of lab tests conducted by Caltex across Asia Pacific & Africa; results may vary from country to country. 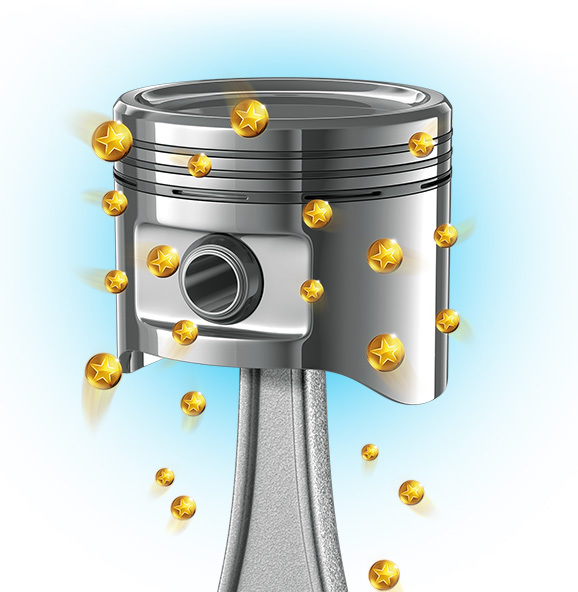 The new Techron® removes deposits that rob your engine of power. With continued use, it will also help to reduce friction in your engine. Less friction means less resistance in your engine, so more power can be brought to your wheels. Engines work best when they are clean. The new and improved Caltex with Techron® is proven to clean vital engine parts effectively, helping your engine burn fuel more efficiently, and making your journeys more economical for you. The benefits of our new Clean and Glide Technology™ were proven in Caltex’s internal laboratory tests. Laboratory tests simulating the build-up of Techron in the crankcase lubricant with continual use demonstrate the efficiency improvement built in to our new Clean & Glide Technology™. In controlled laboratory tests simulating continual use, Clean & Glide Technology™ produced results, which showed 2-3% less fuel consumption when compared to our previous formula4. 4 On the road benefit depends on many factors including vehicle type, local conditions and driving style. Drive to your nearest Caltex station to try our new Clean & Glide Technology™. Now available across all our petrol grades. Unleaded 95 with Techron® is suitable for most drivers. Techron cleans vital engine parts, preventing the build-up of carbon deposits to help deliver maximum power and performance. Unleaded 93 with Techron® is designed to maintain optimal engine performance. The proven power of Techron helps keep dirty engine deposits at bay for better efficiency and fuel economy. Lead Replacement Petrol 95 with Techron® is suitable for drivers whose car engines may require protection against valve seat recession. Techron advanced formulation clears up engine deposits to help improve performance for a smoother drive. Lead Replacement Petrol 93 with Techron® is a high quality lead replacement petrol incorporating an exclusive, multifunctional deposit control technology to ensure maximum performance and economy.